So I finally finished Superman’s Christmas present. I don’t know about you, but when I start a project I’m all This is gonna be fabulous and when I come to the end of a project I’m all sigh…I wish I was finished ALREADY! I felt that way about school too. At the beginning of the year I was always gung ho. Doing all my work diligently and as neatly as possible. This lasted till Christmas break. By January I did alright but by the time March rolled around I was beyond ready to be done. I didn’t want to feel that way about this sweater. Alas….it was not to be. Now on to my next project. A sweater coat for the girl. It is fair isle, so hopefully it won’t be as errr…boring. ♥ Not much as happened this week. I vacuumed, clean toilets, swept and folded an inordinate amount of laundry. ♥ This month is Pastor appreciation month, and since the Dad is a pastor I went to his church yesterday to you know…appreciate. I got to see the parents and the girl got to see her besty bestie girl friend. The mother had me read a letter written by someone else to the church. I’m always up for doing stuff for the Mother, soooooo I got up, read it and came to a word that I just don’t say….and I said it… ain’t The girls laughed. 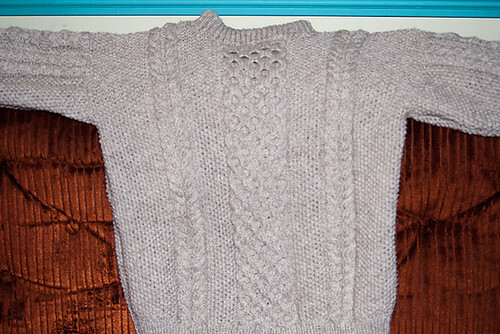 ♥ I am almost finished with Superman’s sweater. I know that I keep saying this, but this time it is true. I have about 64 more rows on his sleeve then I can sew it up and be done. Then I will begin working on this. Only the pattern is so tiny I need Superman vision to read it. I will go blind making this coat. ♥ The entire time I have been typing this, I have been trying to upload our “random monday” banner, and it won’t. So your just going to have to imagine an orange rectangle with Random Monday on it. Deb, I blame you. ♥ The Frankinmonsterstorm thing has brought rain, rain, rain. Nothing worse than trying to drive on streets that are full of soaked leaves. Soaked leaves are slippery especially when you try to suddenly apply your brakes. ♥ I heart cereal. But I hate it when it gets soggy, so I pour myself a bowl, dump out half and add milk. When the first half is gone I add the second half. That way the cereal doesn’t get soggy. I’m smart like that. I don’t have much because I’m all about the boring. 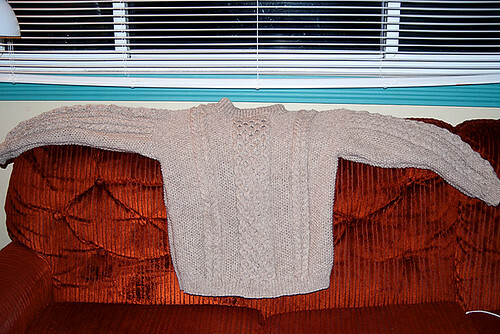 ~~ I finished one sleeve on the sweater that I’m making and began to work on the other. I’m beyond excited to almost be finished with this sweater. This is my first sweater and to be almost finished with it is wonderful, but also the front, back and other sleeve is attached, and it is so heavy that it keeps sliding down into my lap and I have to keep dragging it back up to my hands. If all my problems were so simple. ~~I bought candy for Trick or Treat. Generally when I purchase candy for myself it is in the small bags and I have a coupon. $2 at most, but have ya seen the prices for Halloween candy? Big signs that proclaim $13.88 for 120 pieces. Like that is some fabulous price or something. Maybe I’ll just hand out tricks this year. ~~Superman brought home Cowboys and Aliens for us to watch. Why in the WORLD would Harrison Ford and Daniel Craig, two fabulous actors, consent to play in such an awful movie. Stupid movie…not worth my time. ~~The girl bought and fried a whole pound of bacon for breakfast last week. Let me just say bacon for breakfast is wonderful. Monday has rolled around…yet again. So that means I’m going to be random. ~~ I spent all day yesterday thinking it was Monday. Very disconcerting. ~~ I spent a wonderful 3 days with some friends from Florida. I found out that if you rarely go out in the sun, then you can keep your skin as smooth and porcelain like as a baby’s. Even at the age of 13. I wonder if I stay out of the sun from now on, if I could get porcelain skin??? ~~ I now want to purchase a 40 ft. RV and travel the country. ~~ Corn chips for supper gives you heartburn. I combat this with ice cream. It is a great combo. ~~My daughter got me a fabulous bracelet for my birthday. It is silver with diamonds. Diamonds they truly are a girls best friend. Speaking of the girl, she got her hair cut like Mary Margaret on Once Upon a Time, and now she looks very similar to her mama. ~~Seriously Dish!?!?! You dropped AMC. Now I won’t get to watch The Walking Dead. huffff….. But I’m not bitter. ~~ I asked Superman for an iPad. I think I’m getting one for Christmas….maybe…. ~ It is 56º in the house so I am breaking down and turning on the heat. Anyone that knows me, knows that this is a big deal. ~ The girl gave me a cold for my birthday. A cold is not a gift worth giving. ~ I finally bound off the collar on Superman’s sweater Christmas gift. Now to do sleeves and sew up. I’m beyond excited. ~ The lawn was mowed yesterday. The first time in about 2 months that that has happened. ~ I have friends coming to visit all the way from Florida this week. Hence the grass being mowed. I’d rather not look like a hillbilly for my friends. I’m afraid that I don’t have enough seating for the friends…hmmmm….I guess people will have to sit on the floor. There goes the not looking like a hillbilly. ~ I’m getting ready to watch The Walking Dead season 2 on Netflix. I have become addicted. ~ CBS has finally allowed Dish to take them back. Unfortunately there are season premieres that I have been unable to watch. Thanks a bunch CBS. ~ Finally I need some new flavors for my Sentsy. Mochadoodle is worn out. ~~I finally get to put flannel sheets on my bed. I’m kinda crazy about summer/winter sheet rotation. Winter sheets do not make an appearance till October even if it is a blizzard outside. Summer sheets don’t make an appearance till May even if it is hellish outside. Same thing with AC/Heat. I don’t turn on my heat till November…unless I just. can’t. stand. it. anymore. Which will me getting aged and all, it might be sooner rather than later. AC doen’t come on till June, unless I. just. can’t. stand. all the sweat anymore. ~~I’m gonna rearrange my living room just slightly…sometime this week…maybe. The girl isn’t feeling her best, and the book shelf that I’m moving from the basement is a behemoth, so it all depends on her. I’m kinda afraid that the both of us won’t be able to move it, but I’m a determined kinda gal. ~~ Superman worked 96 hours last week. That’s why he is my Superman! ~~ Walmart won’t let me stack my coupons anymore. I’m much displeased about that. Now I have to rethink how I’m going to coupon, and I just don’t want to think. ~~I’m more than halfway through making Superman’s Christmas sweater. I would be further along had I not goobered a huge section and had to fix it. ~~ I’m happy that fall tv programing is finally back. CBS dropped Dish, so I’m not getting most of my shows. That’s okay though. I’ve showed them. I’m watching them on their web site…all except Person of Interest. I can’t find it anywhere, and believe me…I have looked. So maybe CBS showed me. Dish! Hurry up and get it straightened out!